Herewith some more random notes and photos from the trip we’re still on. Maybe some day I’ll gather up these travel posts and sort the notes chronologically (not on a blog and not particularly for publication, as I don’t fancy myself a travel writer by any means), but for now I make no such promise. If you are a newcomer to this blog, you should know that it is usually devoted to topics of at least tangential professional interest, but for the duration of the round-the-world trip my wife and I are taking, I am using this space as a travel journal for my own benefit. Feel free to ignore this space until after June 10 or so. Taking a shortcut across a park in Fremantle (near Perth) to get to a brewpub on the beach, we walked past the sort of statue of a local historical figure that you might see in any park in the world. But we noticed that it bore two bronze plaques, one above the other, and stopped long enough to snap these two photos. This monument was erected by C. J. Brockman as a fellow bush wanderer’s tribute to the memories of Panter, Harding and Goldwyer, earliest explorers after Grey and Gregory, of this terra incognita, attacked at night by treacherous natives, were murdered at Boola Boola near Le Grange Bay on the 13th November 1864, also as an appreciative token of remembrance of Maitland Brown, one of the pioneer pastoralists and premier politicians of this State, intrepid leader of the government search as punitive party. 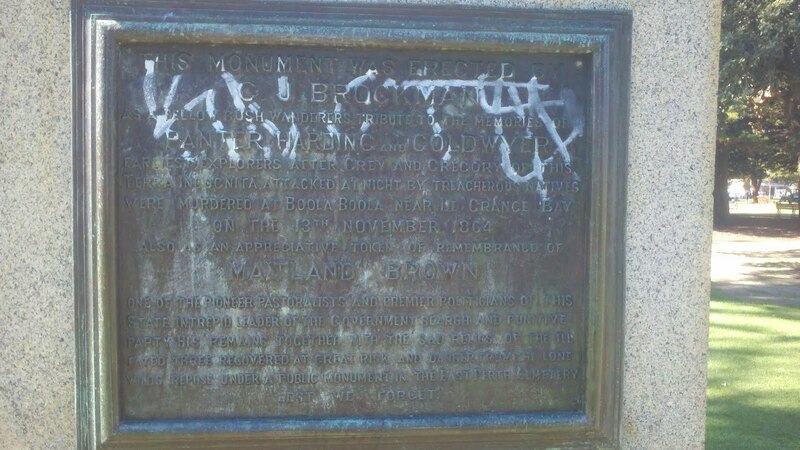 This plaque was erected by people who found the monument before you offensive. 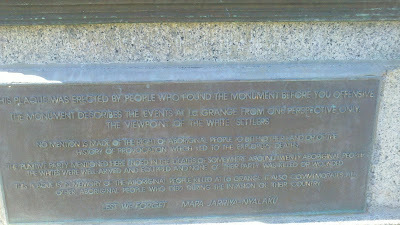 The monument describes the events at La Grange from one perspective only: the viewpoint of the white ‘settlers.’ No mention is made of the right of aboriginal people to defend their land or of the history of provocation which led to the explorers’ deaths. The ‘punitive party’ mentioned here ended in the deaths of somewhere around twenty aboriginal people. The whites were well armed and equipped and none of their party was killed or wounded. 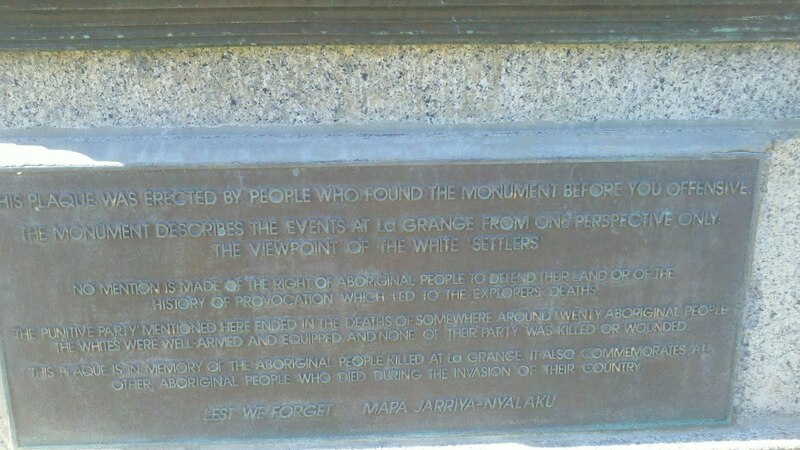 This plaque is in memory of the aboriginal people killed at La Grange. It also commemorates all other aboriginal people who died during the invasion of their country. In googling for more information on the incident, I came across this recent essay by a local student. We walked from the market, where we bought the items on the day’s shopping list, some for my class, some for the afternoon class, to the home where the classes are held. The prep area was a mat on the living room floor. For the first hour I knelt (I’ve never been able to sit cross-legged, even when I was little). After that, I retired to a couch and a small prep table was provided so I could work sitting. 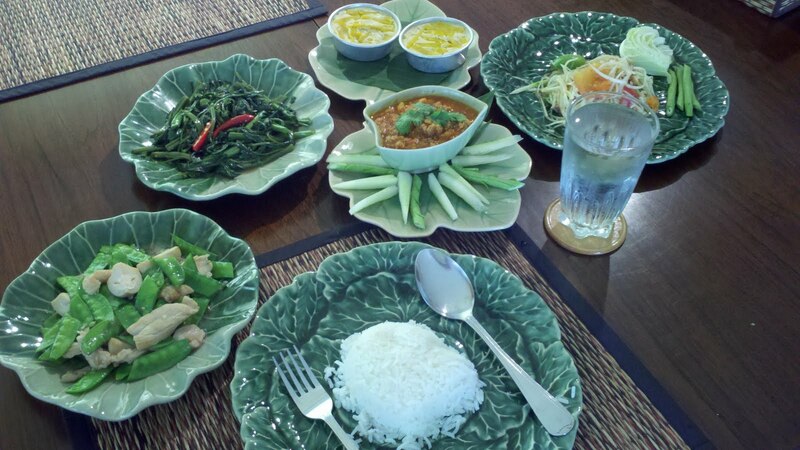 Closely following instructions, I made the dishes in the picture. Clockwise from the left: stir-fry of snow peas, straw mushrooms, and chicken (not a challenge, but I picked up some pointers); stir-fried water morning-glories (pad pak bung fai daeng); pumpkin custard (dessert); papaya salad (som tum); and (in the center) pork and tomato chili dip (nam prik ong). Throughout this trip I have been whining about the difficulty of finding coffee I like. There has been plenty of expensive coffee that other people like, so I know I’m in a distinct minority. Nonetheless, I’ve resented spending more than I think it’s worth for coffee I don’t particularly enjoy. I had promised to drink green tea instead, but so far I’ve only done that occasionally. I did find that one great coffee place in Perth, as previously noted. Coffee in Singapore and Malaysia was uneven, but I found some that was drinkable. 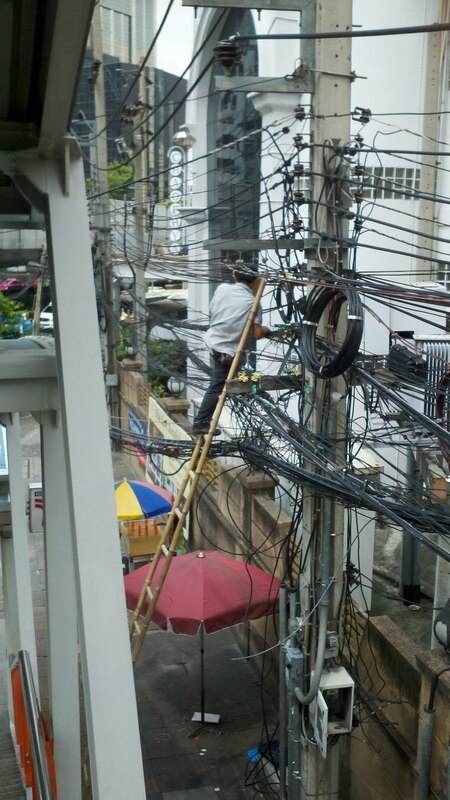 And then we got to Bangkok. The first opportunity to drink coffee as we were whisked around on our VIP tour was in a gift shop that sells only goods made or grown in Thailand. That included the coffee, and the coffee was delicious. It had a rich, deep, strong, chocolaty flavor, without a hint of bitterness. It went down smoothly, with no acid reflux. For the rest of the week, I had coffee that was perhaps not made so skillfully but that was nonetheless immediately recognizable by its flavor as being from the same region. Thai coffee is worth looking for, although I don’t know how much of it is exported. 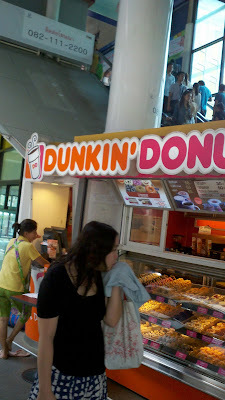 In both Singapore and Thailand, I encountered “3-in-1” when trying to get myself a glass of iced coffee. This vile substance is a premix of coffee, sugar, and some sort of milk product (probably condensed milk) sold from a dispenser. It is to iced coffee what a McDonald’s hamburger is to Chateaubriand, although perhaps that’s unfair to McDonald’s. And “iced coffee” in this part of the world (including Israel, where I am as I write this) is a rich, ice-cream-based dessert drink. 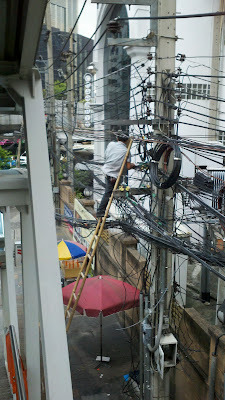 I snapped this telephone lineman from a pedestrian overpass. Click for the larger image. 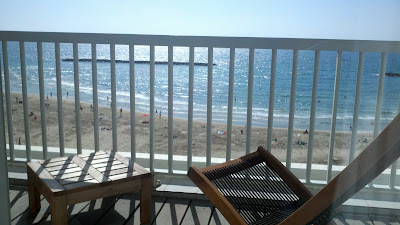 The view from our hotel room in Tel Aviv.